LATE DANIEL OLUWOLE AJIBODE was one of the early generation of footballers to etch their name in Nigerian football folklore during the 1960s. In continuation of my occasional series to document and honour our past sports heroes, I hereby dedicate today’s column in his memory. THE remains of soccer icon Daniel Oluwole Ajibode, will be committed to mother earth at his Ilaro home, Ogun State, on Friday, May 26, 2017. The adorable football coach, who passed on at Lagos University Teaching Hospital, Idi-Araba on Friday, April 25, 2017 after a brief illness was born at Ilaro, the commercial nerve centre of Yewa province of Ogun State on June 7, 1943 by Pa Joseph and Mama Anna Ajibode. He attended both Ilaro Grammar School and Egbado College between 1956 – 1959. He took an early interest in sports and rapidly became noticeable in football in many competitions. He received the attention of the football authorities in the old Nigerian Western Region when late soccer impressario Tesilimi Akanni “Thunder” Balogun was directed to go on recruitment tour of the state, preparatory to the formation of a solid football team for the region. Interestingly, Dan was playing in an F.A. Cup match involving Ilaro and Ibadan, where “Thunder” Balogun was the guest of honour. The result of the match notwithstanding, slim-built Daniel Ajibode, shone like a northern star and sold himself to stardom as he became the only player picked by the soccer-wizard Tesilimi Balogun. Dan eventually landed at the bustling city of Ibadan on a soccer voyage. He navigated his way into a popular city club, known as Republicans FC, where he steadily carved a niche as a fearless and dependable player. Becoming very popular with the Oluyole football fans, the lithe and skinny Ajibode, desperately in search of the “golden fleece” arrived in Lagos and moved expectantly to the camp of Stationery Stores Football Club, arguably Nigeria’s most supported football club in 1964. Playing the role of a fringe member of the famous Stationery Stores for some considerable period, Dan Ajibode became a house-hold name when he was left behind to lead Stores in 1968. How did it happen? Ajibode was not fit enough to be selected amongst the 12 players picked from Stationery Stores to represent Nigeria at the 1968 Olympics Games in Mexico and had to contend with the challenges the absence of the team’s regulars posed to him in local league matches. He became like the fabled Rock of Gibraltar in the defence of a depleted Stores side that played five matches without defeat in a spate of one month. Though, with a very lean frame, Dan was sturdy and robust in the Stores defence as he led the team to victories in the absence of the team’s regulars. As a befitting tribute to his courage and steadfastness, Ajibode was given the accolade “THE LANDLORD” by the teeming supporters of the “Flaming Flamingoes” for holding forte so successfully. Having served Stores meritoriously for almost a decade, Ajibode retired and veered into another area of football, this time into coaching profession. He took the gauntlets and carried the banners of a relatively unknown National Bank Football Club of Lagos where he made name by producing star players like Paul Okoku, Bremner Aladat, Yemi Adebanjo, Yemi Odubanjo, Taiwo Afinni, Andrew Aikhomogbe, Deinde Akinlotan, Waliu Aiye, Jabar Shomade, Segun and Femi Olukanmi, Waidi Akanni, Taju Disu, Godwin Okoloba, Nathaniel Ogedengbe, Yakubu Agboluaje, Lati Daramola, Emmanuel Martins, Carlos Onisemo, Muri Onigbanjo, Sobande Adeniyi and Macmillan Ogbomo, to mention only a few. Many of these players would go on to represent Nigeria at the international level. For almost 17 years, Dan led National Bank FC to a respectable position in Lagos football league and became a torn in the flesh of notable teams like Stationery Stores and NEPA FC. He led his steam popularly known as Nat-Bank to an Oba Cup victory in 1983 at UAC Stadium against the hot-favourite Stationery Stores backed by a vociferous crowd of chanting and ranting supporters. There was an incident in 1979, when Ajibode ordered his boys not to honour a match against Stores if adequate security was not put in place. The match had to be postponed and Ajibode earned the scorn of Stores supporters, who later branded him with the tag, “AJIBODE NO SECURITY” that lasted long in Lagos football folklore. A no-nonsense coach, Ajibode would never accept any form of laxity from any member of his team, no matter how seemingly indispensable the player might be. There was no way Dan could divorce himself from football, as he personified the game he loved with an unbridled passion. From coaching to administration, Dan regularly answered clarion calls from Lagos State football authorities for his expertise in the quest for honours at the national level. He was at various times a member of the State Sports Council and a respected football buff until his death on Friday, 28 April, 2017 at the age of 74. He had established an evergreen sport equipment shop at Iponri market under the brand name Dan Ajib Sports Shop since 1991 and the business is still flourishing. To my generous and kind-hearted Daniel Oluwole Ajibode, I say good night and good bye until we meet to part no more. 1. 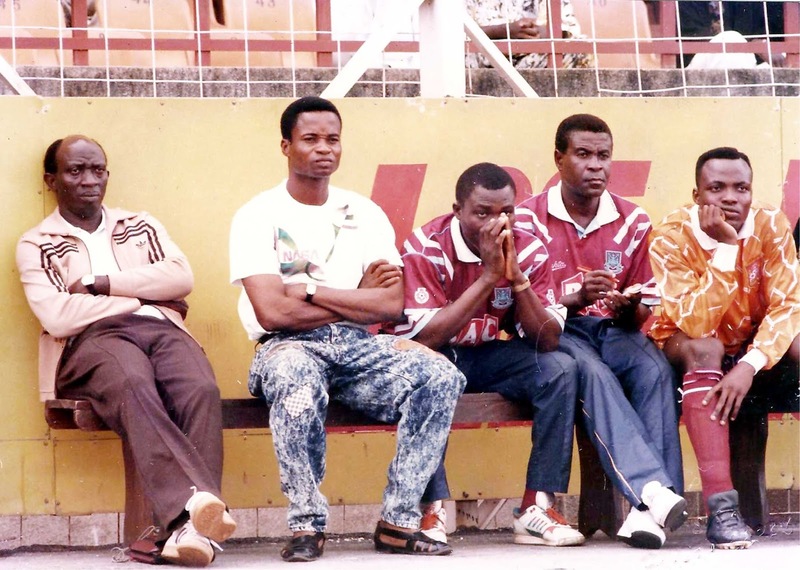 DAN THE TECHNICAL ADVISER: Dan Oluwole Ajibode (first left) with coach Abdullahi “Bebe” Salisu (2nd left) and Augustine Ofuokwu (2nd right) on the bench for Stationery Stores when they won the Nigerian League title in 1992. 2. 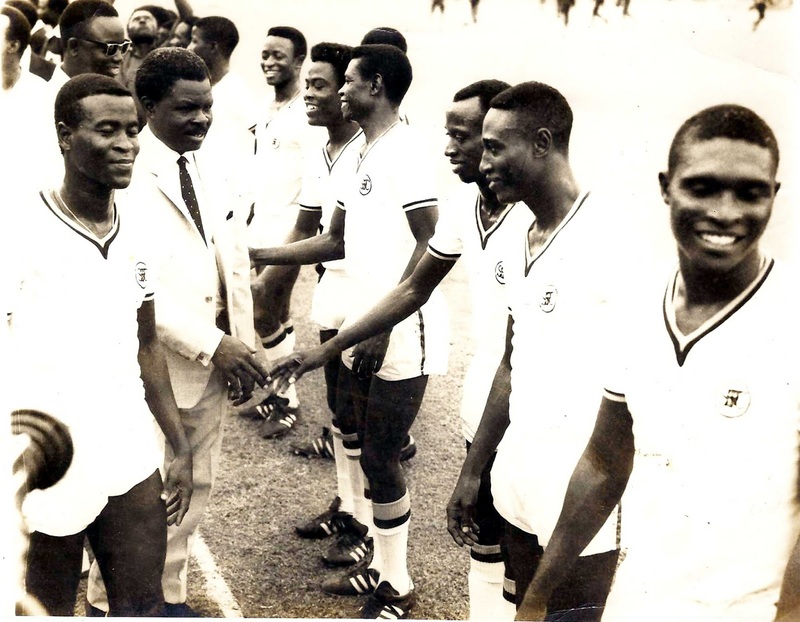 DAN THE DEFENDER: Ajibode shaking hands with former governor of Western Nigeria, Major Gen. Adeyinka Adebayo before a match for Stationery Stores against Asante Kotoko of Ghana at Liberty Stadium, Ibadan in 1969. To the left is Augustine Ofuokwu and to the right is Peter “Eusebio” Anieke. 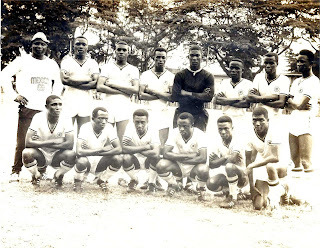 STANDING L–R: Peter Eto Amaechina (coach), Segun Olumodeji, Sam Opone, Mohammed Lawal, Peter Fregene, Willie Andrews, Augustine Ofuokwu, Tony Igwe. STANDING R–L: Peter Anieke, Dan Ajibode, Edward Boateng, Sunny Ine, Avii Awotoro, Muyiwa Oshode.